My “Quatro Décennie” project began with an invitation to teach domestic machine quilting at HMQS (Home Machine Quilting Show). The show requested at least one quilt for the teacher display area. Since I was teaching quilting feathers and fills, I decided to use my BERNINA 820 and make a new wholecloth design featuring those techniques. The HMQS theme for 2013 was “That’s Amoré” (That’s Love) so keeping with the theme, I named my quilt “Quatro Décennie,” which means “four decades” in French. It was my husband’s idea because we are in our fourth decade of marriage. Four hearts were a must and I added plumes in the corners. For the center I chose a circle of feathers and framed the design with a gently curved feather border. 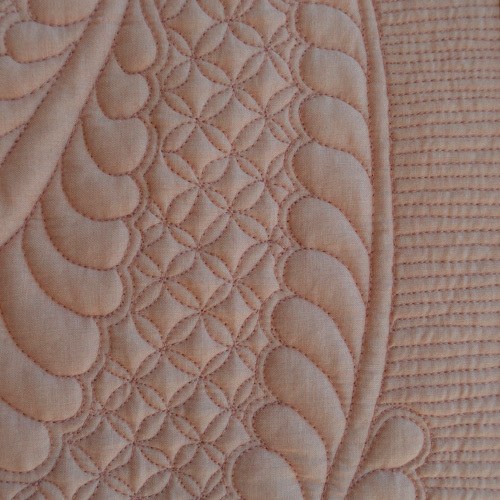 My Feather FUNdamentals class included three kinds of feathers and I decided to use formal feathers for this quilt. These feathers require backtracking when stitching, but they are so pretty it is worth the extra effort. I used seven different fills from the Fills with Skill class: Echo, stipple, spiral, pebbles, straight lines and the wineglass pattern (Diane Guadynski’s “Diane-shiko”). The fill patterns are small because I learned the hard way a that a large, curved meander makes feathers disappear. A tight fill flattens the backgroud so the feathers pop. 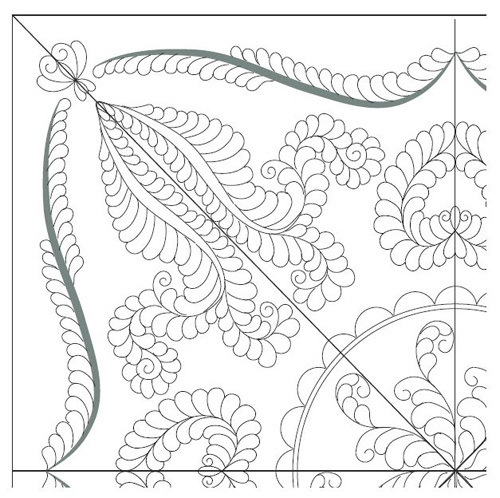 I designed the pattern using pencil, paper, a scanner, and Adobe Illustrator on my computer. I started with one quarter because a symetrical wholecloth can be designed in quarters and then rotated 90 degrees. I played around with different feather patterns, the shape, scale and placement until I was satisfied with the overall look. When my design was ready to print I paid the county recorder to print one half of the design on the large format printer they use for maps. I traced the design onto my fabric using a blue washable marker and my homemade light table. My light table is a large piece of used glass with smoothed edges, two under-the-counter florescent lights, and bread pans or cans to lift the glass off my counter. It works great! Pin basting achored the layers and then I quilted the feathers. I added an echo around the each feather design. The echo lines accent the feathers but also provide breathing space between the feathers and the fill. Retracing the echo line is a great way to travel without a stop and start. It is also makes a good boundary for quilting the fill. Planning fills at the beginning as part of the quilt design is a good idea. I was certain I wanted straight lines on the border, tiny stippling inside the hearts and plumes, and the small wineglass pattern around the inside edges. I marked a 1/2 inch grid for the wineglass pattern with the blue washable marker when I transferred the feather design. However, I decided on pebbles, additional echo lines, and the spirals as I quilted. Each fill creates a different texture. For instance, the pebbles clearly define the center circle. 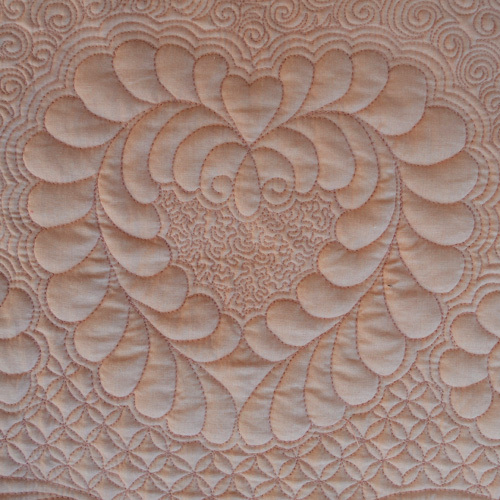 Quilting two fills around the hearts and plumes forms a secondary design. Tip: Tiny fills look better and quilt smoother with a smaller stitch. This means running the motor a little faster or moving your hands a bit slower. If using the BSR (BERNINA Stitch Regulator), reduce the stitch length and it will automatically adjust for a shorter stitch. The thread I selected was Superior Threads’ So-Fine in a color slightly darker than my fabric. 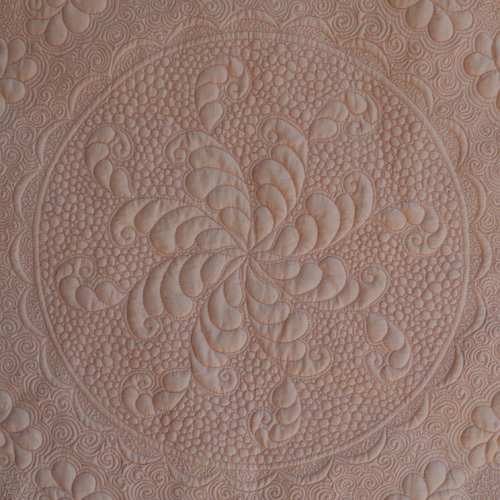 I quilted with a Topstitch needle on fabric from Moda’s French General line. The batting is Quilters Dream 100% wool which gives nice loft in the feathers without using trapunto. 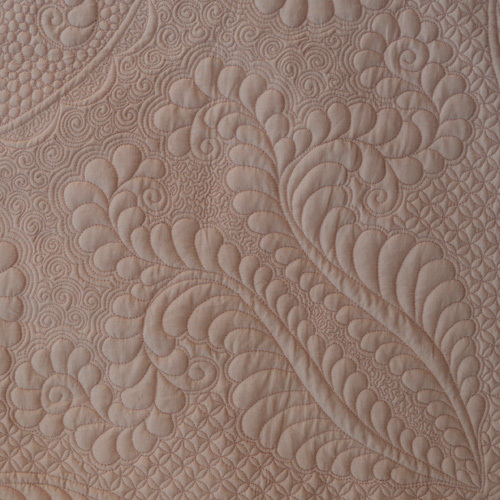 I loved quilting “Quatro Décennie” on the Bernina 820. This machine has a nice consistent stitch, lots of power, and a large bobbin. 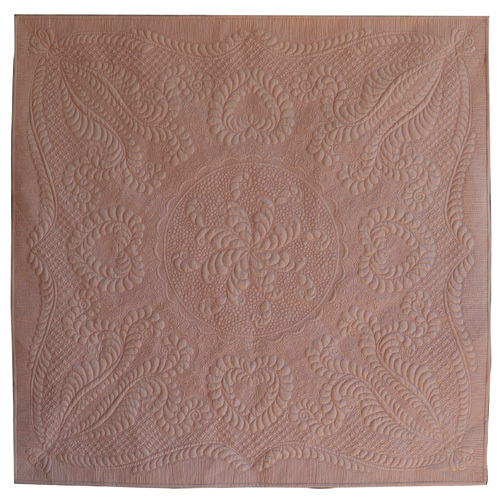 The tension is easily adjusted and the twelve-inch arm gives plenty of room to manage the quilt. I use the BERNINA Freehand System and the foot pedal needle up and down features constantly so I don’t have to lift my hands off the quilt. The excellent lighting is very helpful for stitching tiny fills and backtracking feathers. Many of my quilts are gifts to those I love. However, I think we will keep this one at our house a while and just enjoy it! That is a beautiful quilt Renae. I have never thought of trying to use my machine for a wholecloth quilt. Well done!